The Avondel Motor Inn - a family operated motel offering quality accommodation - is central to many of Benalla's heritage & historical sites. The Avondel is easy to find - only 800 metres south of the CBD on the Melbourne side of the township. Deluxe and Standard Accommodation Available. Beautifully appointed rooms with comfortable queen-size bed, leather couch and coffee table for those days you feel like lounging around watching movies or sport on Austar now with FOX FOOTY and SKY RACING on a new flatscreen LCD TV/DVD. Complimentary DVD's are available. Enjoy our solar heated swimming pool and have a late Sunday checkout (by arrangement). 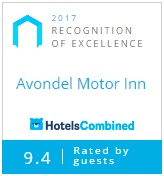 Business are appreciating the Avondel's assets with extremely comfortable rooms (queen bed in every room), modem lines, good lighting over benches, fax and secretarial services and charge back facilities (in reception) to great eating places nearby. We also have a small conference/meeting room and are fully licensed. Avondel can cater for group accommodation. Please contact us for our group booking rates. All major credit cards accepted including Diners and Amex. Surcharge may apply.